Been away... actually still away, but apologies for the bland posts which are mostly things I left in the system to be posted while I was away. But catching up on news what do we learn? Football: What is up with the Steelers ownership melodrama? This has even reached into the musings of the NYT Freakonomics column which has a copy of Art Rooney's letter to his children portending the situation his sons now face. Professor Dubner does not mention it, but is this a classic example of rational expectations? Baseball: You know its another lame Pirates season when again the opening of training camp displaces all the baseball news. I say it's a well thought out plan to put out news on trading deadline moves during the Steelers camp news crescendo. It hides the capitulation that is now an annual ritual. What other place in the country with a major league professional baseball team has its media coverage seconded to what happens to the football teams punter even. Which is a good excuse to repost this video of Daniel Sepulveda in college. But as for Pirate baseball: ugly. Casino: Where to begin? Where to end might be a better question. I actually think that the North Shore site where this is all supposed to be built must be vexed or something. That same site is where Riverboat gambling was supposed to go at one point. Thus far the only 'winner' in the current casino imbroglio is John Connelly who was able to finally unload the parcel which he had been stuck with since buying it in anticipation of the Riverboat gambling license. Be careful what you anticipate may be a lesson for the here and now. Summary: uglier. Casino/SEA/Arena: Some things really are odd in the fundamental fact that the media can't get a clear answer over who and how the arena bonds will be paid. I think we will have to get back to this, but for the moment: What Fester said. Speaking of energy, and more why Pittsburgh may already be Energy Burgh... take a look at the news on the beginning of construction of new nuclear power plants in China, but also this recent article from the Department of Energy on the status of new nuclear plant applications in the US. Not to forget about coal. Looks like the PG had a story on the impacts of high coal prices on consumers. That is very true, but that story overlooked the big local story on the impact of skyrocketing coal prices on local communities, especially metallurgical coal which has really jumped in recent months. There are significant economic impacts in the greater Appalachian economy resulting from coal price swings. If there are no other similarities, both the coal and nuclear industries are extreme cases of industries that saw very little growth in recent decades. The result was minimal hiring and a cohort of workers that aged in place which result in an imbalance in the timing of retirements. The nuclear workforce may be smaller more specialized, but the coal workforce in particular is resorting to new methods to find new recruits. News is that Siemens is looking to sell off its fuel cell division here in Pittsburgh. It is actually part of a very large reorganization at the multinational firm involving over 17,000 job cuts. It may not be the end of the fuel cell work here, but it’s a quiet turning point for a story that was once pretty big here. Westinghouse’s power division was bought by Siemens and would remain here in Pittsburgbe part of a division at Siemens actually named Siemens-Westinghouse until recently. One of their major projects was an attempt to commercialize fuel cell production. Their focus product was not a fuel cell for cars, but a larger product that could be used for small co-generation applications and other stationary applications. They put a lot of money into the project and the site selection for where to put the manufacturing facility was highly sought after both nationally and within the region. So highly valued it was that no less than Ross Perot worked hard to put incentives on the table that would have enticed Siemens to build the plant in Texas. In the end they decided to keep the plant here in the region. Why? Talking to some of the folks involved, the reason was mostly a workforce issue. This was a highly specialized technology to get off the ground and the Siemens (formerly Westinghouse) workforce was likely one that was not going to relocate en mass down to Texas. So even with much greater financial incentives on the table, they chose to build there plant here. Where here? That was a regionalism debate unto itself. The final sites they considered included locations in Armstrong and Allegheny counties. When they chose a site at the Waterfront Complex in Munhall, there was a lot of consternation between county commissioners that the site had been stolen from Armstrong County. In the end, plant would not be completed to production stage. Fuel cells work for sure, but I believe they could never get the engineering to work to make a product that was commercially viable cost-wise. The building destined to be the manufacturing plant would be empty for years and has since been bought to become a research operation for US Steel. So this one project entailed some of the core issues of regional competitiveness, site selection, regionalism and technology commercialization. Maybe the story isn’t over. I am not sure how I came across this picture in flickr, but the best Pittsburgh-themed t-shirt I have ever seen may shown in this picture. I can't figure out where it came from though. Anyone? But not to dis the other great products out there.. The Inner Yinzer in me really thinks the parking-chair motif t-shirt says it all. Nonetheless, I think there are a few other Pittsburgh themed fashion outlets out there, for years you could own some bridge-wear. Of course there are the I Heart Pgh tee's out there. Reading assignment for the day.. a history disseration from 2006. No, this isn't about billboards at all. I thought I would try some bait and switch; otherwise who would want to read about boring Pittsburgh pension math. I really am confused. Lots of news of late about the city's financial status and its now-denied request to leave Act 47 oversight. From news reports to the state's own press release, they all refer to the city's unfunded pension liability as being $462 million dollars. I am pretty sure that figure comes from reports reflecting the state of the pension system as of January 1, 2005 which is more than a little dated now. At the time the total pension liability for the city of Pittsburgh 3 main pension system was reported as $843 million. Since there was reported to be $373 in the bank at the time, the unfunded liability worked out to be $469 million, or alternatively that the pension system was roughly 44% funded. What I don't understand is why there is no reporting of the more recent data which the city reported to the state in March. The more recent reports, reflecting the state of the pension systems as of January 1, 2007 showed that the total pension liability for the City of Pittsburgh exceeds a billion dollars for the first time ever, $1.04 billion to be more precise. Total value of assets to cover that was $375 million at the time, so the city's pension systems collectively were underfunded by over $660 million (not $460 or so) and have a funding ratio more like 36% (and not 44). Funny how the city does not go out of its way to mention how big the pension liability has increased in just the last few years. Well, not that funny, I can understand the motivation. But I don't quite get why the state does not read the actuarial reports the city sent to them in March. Looking back, here is the time series of the total pension liability for the three main pension systems. Anyone discern a trend?? The trend has a couple causes. Some of it comes from what may need to be conservative assumptions on future mortality. I'll get back to that, but there is a big jump between 2005 and 2007 that is a story unto itself. I believe that increase (biggest ever increase? maybe) results from a lot of early retirements that the Act 47 process induced. So instead of getting continued work from a lot of folks that anticipated decreased benefits down the road if they remained on the job, they did the logical thing and retired early. It might have saved some dollars up front which I am sure the Act 47 folks will take credit for, but realize there is a big chunk of those costs were really just displaced into future pension liabilities. Those early retirees are going to be collecting benefits for a lot longer time than they would have otherwise. That big pension liability jump from 2005-2007 amounts to $190 million dollars unto itself and obviates a lot of what is being counted as 'savings' that resulted from Act 47. Not all of it for sure, but enough to make note of. In the long run it's about the funding ratio. 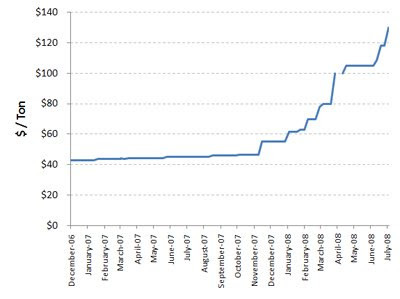 The funding ratio which is the ratio of assets to that total liability looks like this over the last decade. Which shows that relative to the other two, the police pension system is significantly less funded. This could become a pretty serious issue really soon. 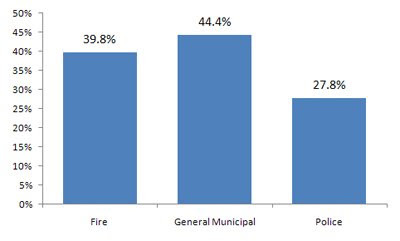 It is also interesting that the fire pension system used to be the highest funded system of the three, but because it has seen the largest percentage of its workers take early retirements, it has unsurprisingly seen the biggest jump in its pension liability, and as a corollary seen the biggest decrease in its funding ratio. Again, these are all numbers for January 1, 2007 which is itself now over a year and a half ago. Both of the key numbers, the total liability and the value of assets invested to cover that future cost have surely changed since then. How have they changed? News reports say that as of April the total $ value in the pension system was down to $350 million. That in itself would put the funding ration down around 34%. But you may have noticed that the stock market has been pretty bearish over the last few months. If you think that $350 has gone down just 10% to say $315 million (the stock market is generally down by a bigger % from its recent highs, but let's hope the investment is well diversified into safer things), the funding ratio could easily be pushing 30% right now. The police pension system could easily be pushing down near 20%. All numbers that are not really qualitatively different from where the city was at before it floated a huge pension bond to fund the system in the 1990's. The point of that bond was to push the pension system to where it would be able to sustainably garner investment income and eventually sustain itself in the future. It hasn't worked out that way at all. If that is not bad enough, go and look at the time series for the total liability numbers. For a lot of really boring reasons I could go into why I think that total liability number continues to go up. Some of it relates to the Act 47 issue earlier, but it also results from a lot of assumptions that you have to make when looking into these future actuarial projections. In a certain sense those assumptions have to be conservative, but I think there is no reason not to believe that the total liability number has continued to inch up. Basically retirees are living longer than is being presumed, and thus every time you recalculate this future liability you see that there are more folks still living and collecting pensions than were expected in the past. So it's UPMC's fault that the pension liability keeps going up. (joke ok, don't want the UPMC police coming after me). But if the average annual increase of roughly +5% has continued, for 2008 the total pension liability could be on the order of $1.08 billion, for 2009 it could be on the order of $1.14 billion. January 1, 2009 is just a few months away so that may be my best guess as to the current state of the pension system. If there is $300 million or so in the bank for a 1.1 billion dollar liability puts you at a funding ratio of roughly 26% overall, which would probably put the police pension system at a funding ratio in the teens. That last sentence is my own educated guess, but the pension system could put a more definitive number on what the assets are in the police pension system alone if someone wanted to give them a call. In the past, I have seen pension reports for the city that assume that at funding ratios below 25% or so, the system would switch into a Pay-as-You-Go type of system. That would have big implications for the city budget near term if that comes to pass. What it all means in the end is that the required payments the city has to make to pay the anticipated liability are shooting up at rates that I am pretty sure are not reflected in any budget plan I have seen. At funding ratio's that low, you have to consider that even if a bull market reappears, the assets will never have achance to appreciate enough to catch up to where the pension fund needs to be. If the trend continues, the unfunded liability will eventually come close to matching the total liability which is now that billion+ number. A billion that is falling mostly upon an ever smaller population base which generates most of the revenue capacity for the city. Without going off on another tangent, the big issue with the city's declining population overall is that there is probably a growing student and transient population in the city. Students, along with seniors, do not exactly have the revenue generating capacity that will ever help with the city's future liability. The city's household population that is it's real tax base has been declining faster than the overall population trend would imply. So per capita, the debt issues are huge and unlike most anywhere else in the country. For reference, current and some past pension documents and other ephemera I collect are on my Pittsburgh Policy Document Collection web page. The data used for the above illustrations are in an excel file I have online here. Moving Datas from 1kilo on Vimeo. PG talks about an epic journey in a converted veggie-oil Mercedes. I just thought it would be a good opportunity to plug the Pitt Veggiemobile which deserves a mention in that story. Maybe while debating the drink tax, we should debate the value of doing a study like that here. The County Controller (wait, don't look, can you name the County Controller?) is making news of late with his claim that if the Steelers are sold the public should get the money put into building Heinz Field back. One issue is that it was money put into the Stadium, not the team and a change in ownership of the team does not really affect who owns the stadium..... so whats the point? Then there is the question of whose money should be returned? RAD money? State money? Maybe those expensive seat licenses people paid for to help fund the stadium? It's all one of those ideas that sounds good in a press conference for sure, but how it would all work out is unclear. At first glance I thought it was just an excuse for the County Controller to garner some name recognition, it being unlikely there was any realistic way that the public could recoup any money. Made sense to think of this as the County Controller (Mark Flaherty btw) gearing up the PR machine for a post-Onorato campaign for Allegheny County Chief Executive. What was Dan Onorato before being elected to the top job in the county? Controller of course. Remember the politics behind the election when Mark Flaherty was elected. At the time council rules forced Jim Simms to resign from his position on County Council, where he was no less than Chairman, in order to run County Controller. There was talk of various deals that was supposed to make that election a foregone conclusion. Like a lot of deals that might have worked in the past it didn't end up the way some intended and Mark Flaherty captured the Democratic Party nomination for controller and would win the post. If not for controller, I always thought Jim Simms would reemerge in local politics. He may be too smart to actually jump back in these days and the public record will detail the personal tragedies he has to deal with as well. But back to the Steelers and their money. The news reports say there is some clause in the lease that says the county must approve a transfer of ownership. So even if it really has no claim to any actual ownership to the team, it might actually be possible to have a claim on the capital gains that will be realized when the team is sold. The lawyers might be empowered to sort that out, or this will all be overcome by events eventually... but here is my thing. You can take a look at the Sports and Exhibition Authority website yourself. It has some minimal information there, but nothing terribly important. Is there any reason the lease between the Steelers and the SEA could not be put online for everyone to see. It would take all of a minute to scan I think. What about the agreement between the SEA and the state over how much funding it will get to support the yet to be built arena? An important document these days with the turmoil in the casino. Try and get your hands on that document and you might as well be trying to gain access to the secret archives of the Vatican. Remember, this is a government body according to most laws. It should not be so hard to find this information. Just for fun, you can read the lease between the SEA and the Pittsburgh Pirates. Thanks to Tim (aka Carbolic) M. for sending me a copy of that contract. Why do these things need to be passed around like illicit blueprints for nuclear triggers? Another important document I have put online, the prospectus for the SEA bonds to fund the new arena which has a lot of details relevant to the public discourse these days? Again, not to be found on the SEA website. So all that neato web programming that makes it look like the SEA website is open and available to the public is mostly for show. One could argue it obfuscates more than it makes available. To be fair, its not an issue limited to the SEA at all, although I would argue that what goes on at a lot of public authorities and special district governments is a lot more shrouded than other public entities. In the City of Pittsburgh uber-activist David Tessitor is trying to get an open government amendment on the ballot as a referendum this fall. So from the shores of the Monongahela all the way over the pond where the Guardian runs a Free Our Data series there is a long way to go with public data access. The best response I ever had to a request for a public document from a public official was "We don't have a public library for those types of things, but if you were able to fund a library for us we could make that available". I thought that was such a creative answer I didn't get mad at all, actually I laughed pretty hard. I first saw this last year and can't recall if I blogged about it.. but the WSJ's number guy reminds me of a neat site http://www.walkscore.com/ which you can use to figure out your own neighborhoods "Walk Score". Not a criticism, but what it misses is access to transit routes which I think is a part of the mix. But it's a neat site, check it out. I found a nearly perfect score in the middle of Bloomfield. A score of 98 out of a hundred for 4700 Liberty Ave.
Let's have a contest. Can anyone find a higher score anywhere in the Pittsburgh region? Where is the lowest score? Rumor: Allegheny County passed the drink and car rental taxes to provide an additional $27 million to Port Authority. Truth: Prior to enacting the new taxes on January 1, Port authority’s county funding came from real estate taxes. That money can now be used to support other county initiatives and the Authority has a stable source of county funding through the taxes. The thing is, I really can't quite figure what point they are even trying to make with that? It almost reads to me that they are arguing against the drink tax, or at least undermining its justification. Also, does it imply real estate taxes weren't stable? or less stable than drink tax revenue? They really have a lot of work ahead of them trying to come up with a constant stream of 'rumors' out there like that. They seem to be a little light on material right at the beginning. I am also unclear if anything they have flagged as a 'rumor' as yet are really rumors to anyone other than themselves. They mostly seem to be generating foils to argue management's side in the ongoing labor negotiations. Yeah, I know that is kind of self-evident. Pittsburgh blog-dom is agog over the developments in Lamargate, specifically the news today that local Blogger Bram was interviewed by staff of the US Attorney and asundry legal begals over his role in bringing certain things to light. I have commented on the whole situation before in Constant Bearing Decreasing Range. I have also said this before, but as a general rule: interview with US Attorney = need lawyer. I don't care if one thinks they are as guilt-free as Mother Theresa, it's a good idea to have counsel with you when being interviewed by Federal agents. Do I need to start up a collection for Bram? Someone ought to at least register freebram.com as a domain. But some out of the way thoughts on the article in the PG. Just the semantics of refering to Bram as a "local blogger" without much explanation. Yes, I know anyone reading this is aware of what a blogger is, but I wonder what percentage of the PG readership is. My mother is a regular PG reader, and much like many I suspect she has no idea what a blogger is. Further, Bram has been pretty up front in his role in all of this to date, or at least I think he has. What was there to interview him for an hour over. Probably a lot of background stuff they had to go over just for due diligence's sake. What is unclear to me from the PG story is whether Bram was brought in as part of something having to do with the Lamargate at all. A Housing Authority lawyer is reported to have been there. It is not inconceivable that his has little to do with Lamargate but more with issues involving the Housing Authority. Who knows at this point? There is a lot of collateral damage to the ongoing crises in the financial industry. On February 19th when this story was written, the price of National City Bank stock had taken a beating and closed at $16.03/share. The big impact locally was on the McCune foundation whose history had left it with a large holding of National City Stock. Yesterday that stock closed at $3.40/share. If that story painted a scary story at $16.03 for National City stock, what does it say for the foundation and the bank at around $3/share. It's an issue not only for the foundation but what is still a big player in the local retail banking industry. Is there a post-media world? 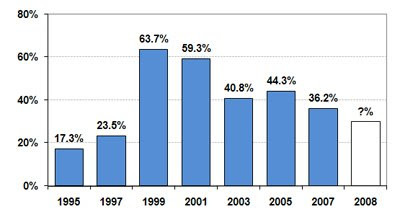 That blog link has a very scary picture of the trend in major media stocks in recent years. It makes even the Dow Jones of late look like a safe haven for your money. Just on the changes impacting journalism in general, or the nexus of blog-dom and journalism at least. The buzz in some journalism circles of late is from a blog comment on some internal comments made following layoffs at the Tampa Tribune. Currently with over 200 comments see this blog post: '"It's Worth Fighting For"'. The author actually being an intern at the Tampa Tribune so you are getting the straight scoop. Not bad for an interns blog. It's still beyond me to parse much more than what is in the headlines over the past/present and future of the Pittsburgh casino license. Still waiting for some of the shrapnel to fall to earth to try and figure out where we are. But I was wondering what Don Barden has collateralized his now semi-defaulted bridge loan of $200 million with. I had presumed it was some of his other casino operations. It couldn't have been his Las Vegas operation. Barden had put his flagship Las Vegas operation: Fitzgeralds up as collateral for the ongoing project. He simultaneously announced the operation was for sale to make that commitment liquid. But.. this just in. Looks like the deal is off and Fitzgeralds has been pulled off the market. So I take it's not at risk here any more, but I could be wrong about that. There has to be something at risk here? If the license gets pulled, you have to imagine that most of the $200 million already spent somehow will be a complete write down. At one point there was talk of loans to be collateralized by Detroit municipal pension funds. Is any of that risk still in play? I dunno, just questions I have. Blog exclusive: Real insight on the state of the Steelers is over on MondesiHouse with this interview of Art Rooney Jr. I didn't realize that Mark Madden had landed somewhere, sort of, but he has weighed in on the Steelers saga in the Beaver County Times: Monday Madden: Losing Rooneys not a bad thing. When I graduated from college some years ago, a couple of my friends took jobs with Schlumberger, the international oil services firm. What they wanted young engineers for was to train them in operating their oil exploration equipment. They would typically set you up with one of their specialized trucks which had as much high tech equipment as you could pack onto it, then send you off to far flung places to find the next mbillion dollar hole in the ground. They would typically have the best stories when you ever caught up with them. So I am driving on I79 this weekend and come up behind a truck that looks to me like a cross between a MAC truck, a street sweeping machine on steroids and something from Transformers. I couldn't figure what it was. Passing it I saw it actually said it was a Schlumberger truck as you might find tooling across some desert somewhere. I have put a fair number of miles driving across Pennsylvania over the decades and I have never noticed a Schlumberger truck in the state. I know the crazy price of oil, natgas and coal all are causing a re-evaluation of Appalachain energy reserves, but the thing that I couldn't quite figure is that given the long history of Pennsylvania oil, could there really be anything left to analyze. The truck itself must represent a pretty valuable and scare commodity in the oil crazy world these days.... but it was tooling through Pennsylvania. Maybe it was passing through to go look for some Canadian Oil Shale? Maybe I just never noticed these trucks before? Maybe it was some other type of Shlumberger truck that did something entirely unrelated to the oil industry? It could have been designed to drill for water for all I really know about geo-engineering these days, but would be shocked if you need that much capital to find water in Western Pennsylvania and points north. Given a dowser I suspect I could find underground water if I had to. I was willing to accept any of those possibilities or something else innocuous, but then came across this article from just the other day via Steve Sjuggerud's newsletter: Why Pennsylvania Land Prices are Skyrocketing. That real estate speculation that never got to us.... incoming? From West Virginia is this news today: High Gas Prices Taking Toll on Turnpike. There just has to be more stories like this lurking all around. It just isn't in me to start deconstructing what the Barden financial capitulation could mean for the city and region. At this point, the gaming board really has an obligation to provide at the very least some quick roadmap for what the resolution to all of this could be to make sense of it all. They can't fix the mistakes already made and we will have plenty of time to assign blame, but right now the sheer uncertainty of the way forward has the potential for ever more harm. The indictments handed down in Bonusgate as it were have all sorts of implications. The headlines go to the indictment of Mike Veon who was the minority whip in the Pennsylvania House, but from a political standpoint he was already booted from office. He can't lose again and it's unclear what successors running for his old seat will be impacted by this. As much as it is not being focused on by the media, what is much more important politically is the indictment of Sean Ramaley. He is currently the nominated D for the 47th State Senate District which has been held by a Democrat, the retiring Gerald LaValle. Can't be good for your election prospects to be indicted in such a high profile kind of way. If a reliable Democratic senate district goes Republican in a body as small as the state senate (50 senators total) it really bodes really ill for Democrats in the Harrisburg. Every single seat counts a lot, especially given how rare it is for a State Senate district in Pennsylvania to ever 'flip'. Basically the Senate is already decidedly Republican (29R-21D) and pushing that to 30R-20D has real repercussions. A supermajority margin like that means a lot things will have to have clear Republic support to be passed, not much chance for swing voters in the middle to be the deciding vote. Does Ramaley remain the nominee? Turns out I am not the only person asking that question, check out the video opining from the Beaver County Times on that topic. Turns out that the Beaver County Times has it's own YouTube channel. Cutting edge stuff for the Pittsburgh region's media. OK. probably need to stick to the knitting a bit. Yes, lost in all the other news was the annual release of census data on the population estimates for municipalities in 2007. What is the headline? the City of Pittsburgh dropped in population from 313K to 311K. The funny thing is that there is nothing really different about the estimate released today for the City of Pittsburgh and most of the other municipalities in Allegheny County. Within Allegheny County the percentage decline for the City of Pittsburgh was right in the middle when compared to other municipalities. 62 of Allegheny County's 130 municipalities had faster rates of decline over the last year while 67 declined a little less or grew a small amount. Other key points include a few things. These really are estimates. Nobody has gone out and counted anything really. These are small area estimates which are the hardest things to get right. County estimates are going to be much more accurate than municipal level estimates. Do I have any real reason to think the numbers are biased low or high? no, but at this point 7 years past the last decennial census we are in a period where there is a real likelihood these annual estimates will be proven to be off. How do they come up with these estimates? They take the county level population estimates which were released months ago and break up the population changes within the county based almost entirely on the number of building permits. Where there are new building permits being issued, more folks within the county are presumed to be moving in, where there is a lower than average number of building permits you figure there is lower growth or faster decline. Also, everyone keeps asking if we are seeing the impacts of say high gas prices on where people are living. These are estimates for 2007, so they are meant to mostly reflect the population in the middle of last year and can't reflect any changes since then. And given the methodology just explained, and given that building permits are applied for well before population movement happens, you really are seeing data reflecting economic decisions made earlier than mid 2007. So it may be some time before any data begins to reflect these things we are mostly conjecturing about such as a return to the city due to gas prices. Oh the pain. Per the PG and the Trib. Now what? How goes the Rumsfeld quote? there are known knowns, known unknowns and unknown unknowns. Closer to the 3rd option right now if you ask me. How much are the Steelers worth anyway? Quite a lot of emotional angst over the potential sale of the Steelers and the eventual role of the Rooneys. Who knew there were so many Rooneys in the greater Steelerverse? For more on the alter-ego horse racing empire of the Steeler clan take a read of: A steely eye for the ponies which was in the Albany Times Union last year. So how much are the Steelers worth? I guess we will find out soon. Sort of a core maxim of economics is that something is worth what the market says it is. If there is some open bidding for the team, or parts of it, we may see what the market price really is. But Forbes regularly values professional sports teams. When they last figured the value of the franchise it was $929 million in 2007. 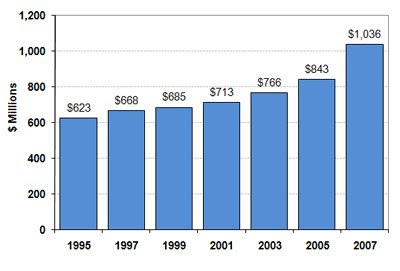 The Forbes valuation has gone up every year and was just $300 million in 1998 which works out to be a healthy 13.4% annual appreciation. If that trend were to continue it would put the Steelers value at just over a billion dollars right around now. As the Rooney family appears to be struggling with, thats a lot, but it is not necessarily the most liquid billion dollars out there. Today the Wall Street Journal has a pessimistic look at the finances of the Steelers in: Behind the Steel Curtain, a Rusty Bucket: Pittsburgh Franchise Wanes As Rooneys Angle for Profit and Control; Outside Bidders Loom. That article imputes a value of $700 million for the team based on numbers being offered among the Rooney clan, but I don't think anyone really knows what outside bids could bring just yet. Sounds like the likely suitor, billionaire Stanley Druckenmiller is a rabid Steelers fan which could mean there is an emotional premia for the team as well. A the same time the WSJ article highlights a number of financial pressures on the team's bottom line that could hurt its valuation as well. With the French buying Yellow Cab and the Spanish buying Kennywood, I wonder if there are some Dubai sheiks who might wind up on the short list of suitors for the Steelers? I have said before that the best public dissemination of data comes out of the Department of Energy's Energy Information Agency. Every Wednesday they distribute their "This Week in Petroleum" report which has just about everything you can get in near real time data on oil usage in the US. It is also the only government report where the authors explaining the data have a bit of humor to help out the otherwise awfully dry content. In the past they have used for context to explain oil trends things like the college football, bad movies, marmots, professional football, major league baseball and all sorts of other things. They do have lots of other data on their coal page. But one of the biggest stories for the region that is not being talked much is what is happening to the price of regional coal. Last week, the spot price of Pittsburgh Seam coal jumped by 10% over just the previous week. Here is a factoid: since Jan 2007 the price of oil had gone up around 230%. The price of Pittsburgh Seam coal is up around 300%. Almost all of that increase is over just the last 6 months!! Which all may explain why the coal industry is resorting to new recruiting tools to get more workers. Not exactly what Richard F. was intending, but man is this funny. Via Adfreak is a tip about this YouTube 'documentary': Distilling creative juices, one vine at time. (Sir) Ed Heath is now officially part of the Pittsburgh Punditry given his comments in the Trib today on the ongoing saga in City Council. The Trib’s Jeremy Boren was probably given 3 inches to fit in a piece that would have taken 30 to explain in any meaningful way, yet one that I hope would have gotten no more than a paragraph for any minimally necessary closure. At this point when it comes to internal politics of city council I am as confused as the beekeepers who are wondering what is happening to all the bees? For sure, City Council has always been a nexus of painful and personal politics. You don’t need to go far into the past to find stories of squabbling amongst themselves. For the local historians out there, some personal spats are legendary: Madoff/DePasquale, Ferlo/Masloff, Polack/Givens to name a few. Yet even when the machinations were pointedly painful, involving profanity or even a few physical altercations on the record you usually could tell what the point of the fighting was about and who was on what side. The problem we have today over the continued squabbling is that the public is confused at this point over what the point really is. Even the most charitable interpretation would find fault with just about everyone involved. How this has dragged on this far is mind boggling. All I can say is that never has a political body had its reputation fall so far, so fast, over so little? Now what? Does anyone really talk much about what is going on with regards to Lamargate. Does anyone remember the mayor’s former press secretary. What issue does the public associate with the whole billboard imbroglio? Yes, this very post has sort of a Heizenberg effect that contradicts itself.. but for anyone who is a public official I really plead: end all of this now. I am sure everyone has lots of things they want to say and get off their chest. We all want greater transparency and communication with our elected officials. Nonetheless, at this point there is absolutely nothing any of you can say on the record that is going to do anything to lessen the public’s confusion in this matter. Stop, end, cease and desist, invoke radio silence on just this issue. There is a point so sometimes just saying “No Comment”. When those pesky media folks ask for “just one comment” to respond to whatever… just say no. Sometimes discretion really is the better part of valor. The good news is that nothing in politics is permanent and with luck this will all be forgotten.. if not by each of you then by the public. This will not be the first issue you all disagree, sometimes on very core value terms. You can’t blow everything up over every instance like this lest what will happen, has happened, is happening, is a complete disfunction where matters that have to be attended to are just completely forgotten. Vote your consciences and move on. Anyone looking at how the city’s pension fund has been faring of late? Add 5 zeros to the legal bill jamming the machine to understand the magnitude of that one issue. In 2006, Pennsylvania ranked first in the nation in cross-border investments, projects whose capital comes from outside a given state, according to an IBM analysis, the latest data available. first? I have to admit I don't have the current reference research by IBM so I can't comment too much. A summary of the previous years report is here and on page 25 you will see some interesting recent trends for Pennsylvania. If you had to pick the ultimate goal of economic development at the state level it would be to attract investment from other states. Obligatory history reference. How long have Pennsylvania and New Jersey been fighting over new investment? years? decades? try centuries. It was Alexander Hamilton who located his Society For Useful Manufacturers in 18th century New Jersey aided by some ample tax breaks to the chagrin of Pennsylvania politicians who felt it was unfair. In many ways it is a battle we would still be fighting more than 2 centuries later. but maybe the article is just a reflection of "always greener on the other side" mentality over in New Jersey? Last week I pointed out that bonds issued by the Sports and Exhibition Authority to pay for the new Arena in town are variable rate bonds. I have the entire bond prospectus scanned here. Variable rate bonds are not that out of the ordinary these days, but its worth noting that a lot issuers of variable rate bonds have run into a lot of trouble of late. Many issuers of these variable rate bonds suffer from what has been described as bidders remorse at this point. Locally the biggest story was about UPMC which actually lost money last quarter for the first time in a long time in part because they had to unwind some variable rate bonds that were quickly becoming money pits. The reason variable rate bonds (think adjustable rate mortgage... except with a few more zeros) are problematic of late has a simple and complex aspect. The simpler problem is that among all the other bad economic stories going on is that some interest rates are going up. Thus if you borrowed a chunk of change at a variable rate, you are finding out that the payments you owe on that loan is going up. The more complex story of some serious market failures in some of the markets setting these interest rates is a story unto itself. Is the SEA bond in the same boat as the UPMC loan? Not necessarily. You can buy all sorts of financial instruments to 'hedge' your risk. The bond prospectus (linked above) and quotes I dug up from the SEA Executive Director all lead you to think the SEA was planning to buy some swaps to hedge their risk here. I don't have enough info to know if they did that thoroughly or not. Risk hedging is a lot more art than science and the question is whether they did it well is not a foregone question. Lots of the economic miasma in the country really comes from the top experts coming up with risk hedges that were worse than useless (remember Long Term Capital Management? or any of the billion dollar rogue traders of late?). Even if they hedged their risk, what risk were they planning for? I was more than willing to give the SEA the benefit of the doubt that is all a non-issue, but got worried again when I saw this headline last week first in some trade publications and then in the Dallas Morning News on Thursday. See: "Dallas Cowboys stadium bonds rise in cost for Arlington". The circumstances sound awfully familiar at the very least. Turns out the Dallas bonds were in trouble for a different reason than UPMC. Those bonds were being hit by the fact that they were variable rate bonds, but also that they were insured by MBIA, a company that sells bond insurance... or did until very recently. MBIA has really flatlined of late and recently has seen its bond rating pulled by some of the bond rating agencies. If you are in the bond insurance business, all you are really selling is your bond rating so to not have a rating is to essentially be out of business. As a company MBIA's equally near-death competitor AMBAC saw its stock fall below a dollar a share last week and was delisted from the NY Stock exchange as a result. If that is all gobbledygood to you, the bottom line is that its all bad news for both companies and anyone doing business with them. Update1: MBIA has sent me an email to clarify that: "Fitch withdrew its ratings on MBIA in response to our request, we continue to be rated by S&P (AA, CreditWatchNegative) and Moody's (A2, Negative Outlook)". OK? Thus in Dallas, bonds insured by a near-defunct bond insurer resulted in their variable interest rates going up. They were being forced to pay a lot more in their bond payments than they planned. Thus like UPMC they went to great effort and expense to call and refinance the debt in question to get out from under the rising bond payments. But does that apply to the SEA here. Still no. Not yet at least. The SEA bonds are not insured by MBIA, as in Dallas, nor by the other bond insurer having similar problems: AMBAC. You might say, good job SEA for now. Anyone still reading? Here is the punch line. The company that the SEA used to insure the bonds is called FSA and until recently it has not been talked about as being in the same miasmic condition of its competitors. The 'until recently' part comes into play when you read about financial analyst Bill Ackman's critique of FSA. He say FSA is next in line to suffer the fates of MBIA and AMBAC. Just a lone voice in the woods? The problem is that Ackman was the single wolf sounding the alarm about MBIA and AMBAC's shaky financial situation for years. So much the lone wolf that the companys attacked and sued instigated an investigation against (see update2 below) him for his analysis which was published in a report he himself put out "Is MBIA Triple A". So of all people, for Ackman to now be saying FSA is racing toward a wall, it gives you pause. So... even if the SEA fully hedged their variable interest risk in the bonds... something I wonder about but give the SEA the benefit of the doubt over.. the bigger wonder is if they hedged the risk to account for the potential that the bond insurer would run into trouble in the future. A swap that provided a hedge against general interest rate volatility in the municipal bond market probably does not provide much help for higher rates that would result from another failed bond insurer. The big question then is whether the SEA hedged against the risk of their bond insurer losing its credit rating? It's not the type of thing you normally plan for. If you thought your bond insurer would lose its credit rating in the near future, you would choose another bond insurer I hope. Until recently, failed bond insurance was considered a zero probability event. Down the road is the SEA going to be in the same situation as Dallas and be forced to refinance its bonds? They would be in a tough spot to refinance what are essentially revenue backed bonds given that the revenue source (i.e. Don Barden and the Majestic Star) has its own problems these days. Don't forget the first sentence. This might not be an issue. For a positive conclusion: if indeed this is not an issue it is because the bonds in question were fully hedged to account for these potential risks. If that is true than the SEA did a better job than a whole lot of other financial superstars did in similar circumstances. If so then I will be the first to say somebody at the SEA and their financial advisers deserve a big raise for not only saving the SEA a big chunk of change, but saving the region from an almost unquantifiable amount of heartburn if the bonds were to go south. Either way, its a big story I would say. Either there is a big problem completely under everyone's radar, or we have some of the best financial managers in the country right here that saved us from some big landmines going off in lots of other places. 1) Are the SEA bonds for the arena construction auction rate bonds similar to what has been problematic for UPMC and other issuers in recent months? 2) Have changes in market interest rates impacted the payments made on SEA bonds? 4) Are there potential impacts on interest rates and bond payments if the bond insurer FSA has its bond ratings downgraded at some point in the future. While we are at it, I'll throw this in for good measure. I have no reason to believe anything improper, but given that the SEA is holding the bond proceeds... how have they invested the cash they are holding. update3: While we are clarifying things. It's amazing how these things all connect to each other. I realize some may not know, but MBIA, the bond insurer that has taken the most interest in this blog post is also the company that once bought out most of the tax liens in the city of Pittsburgh causing innumerable problems until they were guilted into selling them back to the city for cents on the dollar last year. A long story I will append to a little later. Postscript: while everything is connected one way or another, most of the above has little to do with the issues raised in the PG this morning about the fees and related costs to city related debt issuances in recent years. But if you want to look at a lot of the past , in addition to the SEA bond prospectus mentioned above, a lot of local debt documents are on my Pittsburgh Policy Document web page. It didn't occur t me until reading the PG story that some of the Water and Sewer Authority Debt is both variable rate and insured by FSA, which means the issues I mention above apply to them as well. See the PWSA's 2008 variable interest rate offering. I really am surprised given the delays in getting casinos running here and in Philadelphia that the idea of temporary riverboat gambling has not resurfaced (some history). But with it's major proponent over the decades, State Senator Vince Fumo, essentially retiring this month I don't see it. But you never know. Just for fun it's interesting to look at recent past prognostications on the impact of rising oil prices. From 2006 is this piece in Reuters: "NYC the place to be if oil hits $100/bbl ? study". $100 being as far a runup in price as could be conceived of at the time. Where do you go at $140 and rising? News in AP and Trib on aging river infrastructure here in Pittsburgh. This is really a big story, bigger than the coverage it gets. They mention some numbers for the amount of rail or truck transport it would take to move just some of the coal or coke that currently goes via barge. The thing is, talk to folks who work in the rail industry and there just isn't capacity to dump that much new demand into the system. The US rail system in general, but especially through some of the chokepoints near here, is arguably past what is sustainable as it is. As for trucks which may be the most costly option of the three becasue of fuel prices? So see the first paragraph above. Speaking of prognostications. News is that the Port Authority has a new web site to inform the public on the status of labor negotiations. It has a 'rumor of the day' section which could be fun. The first 'rumor' was that service would stop when the current contracts end on July 1st. Funny thing is I heard nobody talking about such a rumor so it's unclear the purpose of that. and read the story for the timing: the site went up Wednesday the 2nd and the first rumor it quashed was already in the past? Curious. But no joking. I will put good money that there will be a strike at the Port Authority. All the talk I hear leads me to believe that the powers that be actually want there to be a strike. I will not be surprised if there is a plan in place early on to use substitute workers in the event of a strike in order to break the union which is really the goal. How will it all turn out is beyond anything I can predict. If the strike is limited to just the port authority drivers then they may be in for tough going and the plan may work. If there is any sympathy labor actions in the region then I dunno how it will turn out. It may be the biggest test for organized labor in the region in decades. Think of it as a local version of the PATCO air traffic controllers strike in 1981, something that had a major impact on labor-management relations for decades. In the end I hope all parties realize that the true cost benefit analysis of transit service is not all measured in the Port Authority's budget anywhere. The casino news of late is focused on the proposed changes Don Barden is making to save money on the construction of the Majestic Star. A lot of those changes have to do with the casino's river frontage and aesthetics. Unsurprisingly, the Riverlife Task Force has taken umbrage to these ideas. What history is relevant? A lot. I am surprised this did not get more coverage a couple months ago. Last March was the 20 year anniversary of the visit to Pittsburgh of Prince Charles. It made a lot of news at the time and since. One of his big messages was that we needed to reopen access to the rivers by our communities. Read the New York Times coverage of his main speech when in town. More in depth coverage of the Prince's visit to the burgh was in Pgh Magazine way back when. Who would've thunk that? Must be a crazy person. The report it references is here. It says that Pittsburgh's housing market is safer than oil boomtown Houston these days?! What is just curious to keep observing is the coverage of housing issues locally. This is at least relatively positive story, we have the least likely chance of decline.. but that is still a far cry from pointing out that almost alone among major regions housing prices here continue to increase while rapidly rapidly deflating most everywhere else. update: I don't take credit for this, but on the semantics of the news... the headline for this particular news blurb was actually changed. It started as "Housing prices in Pittsburgh less likely to decline in next two years, report says"... but then after I blogged about it it became: "Housing prices in Pittsburgh unlikely to decline in next two years, report says". I added the emphasis in both cases just to highlight the change. It may seen innocuous, but the former implies pretty strongly that there will be a decline in housing prices, we are just wondering by how much. The latter is closer to what the report in question says that there isn't anything observed thus far that says local housing prices are going down at all. Maybe I am missing something?? It's strange I don't see this in the PG, but PG editor David Shribman has a piece in Bloomberg pointing out that today is the 100th anniversary of the birth of Teenie Harris and that his photos are now online at the Carnegie Museum. It really is an amazing coincidence that Teenie Harris' birthday occurs right on the day there is news that the Sports and Exhibition Authority is letting the first contracts for the construction of a new arena. Harris' studio, along with the neighborhood it resided in were erased by the construction that would become Mellon (née Civic) Arena whose days are also now numbered. A new beginning? or back to the future? It's up to us to determine. Should we talk more about the state of the casino? billboards? impending Port Authority strike? Arena funding? Pension liabilities? Ugh..... I depress myself. Maybe some trivia therapy will help. I was joking when I first said this, but maybe the Pittsburgh diaspora does acts as the new Illuminati. In the political world there are more connections than most realize, at least beyond ex-Burgher Ron Paul's run for President. I watched the HBO movie Recount last week. Any political junkie know the big Pittsburgh(er) connection in the movie? That's too easy. For balance and something a little harder: Here is an interesting article on the race for President in the Washington Post from last weekend. There are several Virginia politicians mentioned in there, anyone know which one has Pittsburgh roots? it might not count as a diasporan technically... maybe better to call them Pittsburgh connections. I should come up with a prize, but you would have to get both. From JG is a heads up to a WSJ article on the travails of financing across the board these days in the gambling industry. See: Debt-Laden Casinos Squeezed by Slowdown. For fun... some interesting video history of Dan Barden when he first was awarded the casino license here. Update: The Riverlife Task force has a press release with some annotated illustrations of what is being cut from the casino plan in order to bring costs down. See the Press Release here..... for more, read the story here. Speaking of gambling in general and stealing an idea from Florida, I expect to see Gus working the pumps pretty soon. whiskey t...... %^*&(%........ can someone explain this to me.. No, please don't try. There is this little matter of a legal bill and city council. First it should be paid, then it shouldn't, then it will be paid and now... get this, the city solicitor says that HALF of it should be paid. Does this mean that half of Reverend Burgess should leave his council seat when they discuss the matter. Does the new opinion specify which half? Seriously, if I were in charge of a PSYOPS campaign to disrupt the politics of city council, I could not have thought of anything better than these opinions coming from the city. update: How much has this all cost? Burgher Jon does the back of the envelope analysis of the city's direct costs over just the legal bill pertaining to Lamargate. If you ask me he way underestimates all the people/time involved, but you get the point. And the cost of Lamargate itself? priceless. and for the record... this is a crime. and an awfully lot more important than the matter of who pays $10K $5K. Jim Russell must not sleep. From Colorado he is organizing a Rust Belt Bloggers Summt in Erie, PA July 11-12. I will be making at least a part of it the evening of July 11 if anyone is nearby then. I think there are events over that weekend as well. See the link above for more info. With that as a theme, and with new regional unemployment data released today, here is an update to the graph I put up on occasion that I track. This has the seasonally adjusted unemployment rates in those core 'Rust Belt' regions: Pittsburgh, Detroit and Cleveland. It's a pretty striking time series and one which I suspect most Pittsburghers wouldn't quite believe. What is really important is not just that Pittsburgh is doing relatively well, it's that where once the three regions had nearly identical unemployment rates, you are seeing large and growing divergence. Detroit's seasonally adjusted unemployment rate just hit 9.3% in May (a huge jump from 7.4% the month before... the biggest one-month spike for them in decades) compared to 5.0% here. Cleveland is 7.3%. Looking at the graph, you can parse it even more, the big spikes up of late in Cleveland and Detroit are matched by only a minor 1/10th of a % increase here, and what is funny about that is even that is partially attributed to a strike at Latrobe Steel. Take that out and you will be close to no change at all here while (formerly?) similar regions are seeing historic jumps. I have to admit that this divergence story is one that I don't understand why it does not get any media attention at all.. or not much at least. This divergence is not about to turn around anytime soon. Auto industry and housing turmoil is far from over for Cleveland and Detroit. While our traditional industries in metals and coal are if anything seeing spiking prices worldwide which means producers here are pushing to produce as much as they can. On local coal and energy, I was driving across Pennsylvania last week and for awhile was only getting reception from a local radio station that was covering live for some time a "oil and gas industry job-fair". I wonder how long it has been since that has happened. A lot more going on of course. A more thorough look at all this is in some references I mentioned in Shiny Rust Belt a few months ago.